In 2004, the Forest School initiative at Bodfeurig School was very successful. In 2005, Coetir Mynydd sponsored Coed Call to provide woodland themed activities for children at the Antur Mynydd Summer Festival. Funding for this event was provided by: Academi, Tir Coed and Coetir Mynydd. The event was accommodated in the Forestry Commission yurt kindly lent by the Llanwrst area office. 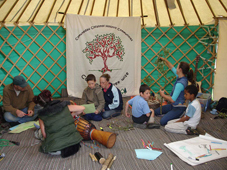 In 2008 the last of the Cydcoed funding was used to support a woodland music project for the young people, organised by Coed Call. See the Documents page for more details.